If your order weighs less than 13 ounces, save huge on shipping with USPS first class (with tracking number). This product weighs 3.7 oz. 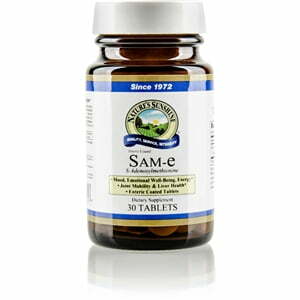 Nature’s Sunshine SAM-e supports emotional health, boosts energy levels, nourishes the liver, and promotes a healthy structural system. S-Adenosyl-methionine tosylate, or SAM-e, occurs naturally in all living cells and assists in biochemical reactions that are essential to bodily functions, specifically the production of neurotransmitters and the continual repair of cartilage. 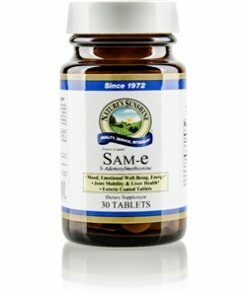 Nature’s Sunshine SAM-e contains 200 mg of SAM-e.
Methacrylate copolymers, glycerol palmito stearate, sodium starch glycolate, silicon dioxide (powdered silica), microcrystalline cellulose (plant fiber), titanium dioxide, citric acid, mannitol, magnesium stearate (vegetable), and iron oxide (natural color).